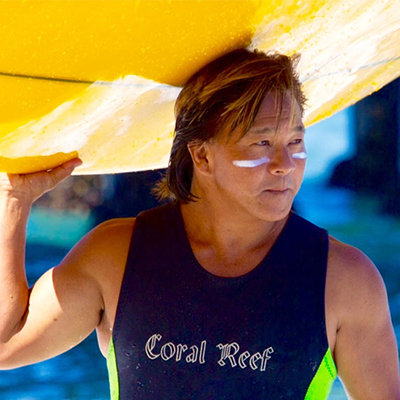 Born in 1964, a native of Southern California and of Japanese, Hawaiian descent, Guy was raised in the surfing and board shaping traditions of his father, Raymond, and Uncle, Donald. Learning to surf at an early age, Guy was winning and placing in many surfing contests not only in the US, but also in Japan. Guy’s hand shaped surfboards are long considered to be the “Ferrari of surfboards” by many in the surfing community. A recent addition to Guy’s surfboard line are his dramatic art boards, with his hand painted characteristic gold, silver and variegated leafing that reflects reverence for his culture and love of the ocean. A man of many talents, Guy has also worked for decades with professional athletes and Olympians in the sports rehabilitation field, utilizing his gift of intuitive energy to promote health and well being. Mana is a form of spiritual healing energy which resides in a person. For over 45 years, Guy has been deepening his spiritual consciousness and lifestyle with the earth’s natural energies and extending it into his apparel line to assist in the optimization of one’s own body to its highest possible performance. Another passion of his is supporting many non-profit charities. In addition to being a regular on the water team for several of the Best Day Foundation southern California chapters, he also gives his time many organizations, including the Wounded Warrior program, Texas Lighthouse for the Blind, Oceanside Longboard Surfing Club, Tri-City Medical Center Foundation, the UC San Diego Moores Cancer Center, Helen Woodward Animal Center and his own Guy Takayama Foundation. Guy Takayama Foundation promotes the educational advancement and the creative and healing arts in local communities by providing scholarships to deserving youths while preserving and promoting the history, heritage and culture of the sport of surfing.